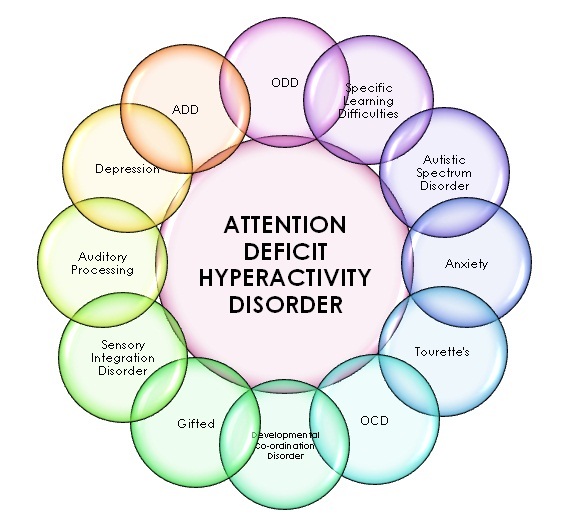 Attention-deficit hyperactivity disorder (ADHD), attention deficit (ADD), hyperkinetic disorder and hyperactivity disorder are different terms used by usual people and professionals. Differences in these terms are insignificant, but sometimes can lead to confusion. These behavioral disorders usually describe the problems of children who have concentration difficulties. Hyperactivity disorder term is used to describe the situations associated with increased impulsivity and activity of the child. Depending on the diagnosis methods, the prevalence of hyperactivity disorder in children of school age varies from 2 to 20%. Symptoms of the disorder may be varied, but usually include problems with coordination, speech, and movement disorders. Hyperactivity without attention deficit is sometimes observed in adults. Diagnosis of behavioral disorders in adults is complicated because of the concomitant or other mental disorders that may have common symptoms. The presence of some of these symptoms does not mean that you should immediately seek medical care. People, who are suggesting that they have symptoms of mental disorders, can independently take online tests for hyperactivity or attention deficit. After testing, people are often convinced that they were worried for nothing, and they have no psychoneurological disorders. If the tests confirm the presence of symptoms of hyperkinetic disorder, there is an occasion to think about and talk to an expert. A single point of view on the treatment of hyperactivity disorder does not exist. Many experts focus attention on drug treatment. Others give preferences to psychotherapy. In most cases, the most effective is a combined therapy of mental disorders. The choice of treatment method of hyperactivity disorder should be individual taking into account the patient’s age and severity of disease. Typically, at the beginning of treatment of behavioral disorders in children, a balanced diet and lifestyle changes in conjunction with various psychotherapeutic strategies are recommended. The most successful psychotherapeutic strategies for adults are based on increasing positivity of thinking about themselves and the future. Therapeutic goals also include learning the management of stress and anger, an increase in physical activity and use of various relaxation techniques. The use of drugs is an important component of the treatment of attention deficit hyperactivity disorder. To help control the symptoms of behavioral disorders, many different types of drugs can be used. The main types of drugs to treat hyperactivity disorder are divided into fast acting with high, average and low rate of release of active substance. The dosage and frequency of drug use are chosen individually and are able to vary during the treatment. People with symptoms of hyperactivity disorder are most often prescribed with a class of drugs called psychostimulants. These drugs are effective in moderate to severe psychological disorders. Psychostimulants can be prescribed for children, adolescents and adults with hyperactivity disorder. These drugs help to improve concentration and to control impulsivity. In case if psychostimulants are ineffective or cause side effects, non-stimulant medications can be prescribed. One of the non-stimulant medications is Strattera. You can buy Strattera medication for the treatment of hyperactivity disorder at the pharmacies of USA and other countries of the world. The FDA approved Strattera capsules in November 2002 as a treatment of ADHD in children over 6 years old and adults. Despite the fact that diagnosis methods of hyperactivity disorder are contested for many years, the treatment of behavioral disorders has already helped millions of people to improve their emotional state. It has been proven that early diagnosis of psychoneurological disorders in children decreases the risk of negative psychological and social effects in the future.